elegance and versatility, combining classical elements of timeless beauty with a contemporary edge. 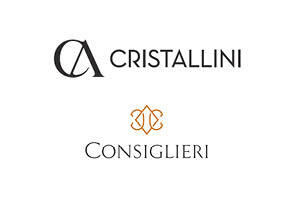 Since our inception in 2009, CRISTALLINI has successfully created a buzz among influential figures and celebrities alike. The ornate gowns and chic ready-to-wear pieces have been spotted on prominent red carpet events as well as popular television networks and recognized editorials. CONSIGLIERI is a dynamic, foward-looking brand, with a contemporary vision of the modern gentleman’s image. We offer our clients a special Custom-Made tailoring experience with unique garments specially designed and personalised for them. Each element of a man’s personal style can be brought out and expresssed through this concept.